In December I was asked to make a small work of art that used scrap materials and could be explored visually and through touch. I had been thinking about incorporating shapes with different thicknesses to give more texture and depth to the mosaic wall pieces and this seemed like the perfect opportunity to experiment and make something different. Most of the mosaics I make give the illusion of depth visually, but intentionally adding a third dimension that would have to function as a visual element and be interactive was daunting. I had a few days to come up with ideas and a week to ship it. My original concept was to take a bunch of shapes arrange them into a mess and cut that mess into a circle. I played around with patterns. Maybe I should make a tree? that would be cool. I decided that I was only going to use triangles. a tree triangle, not exactly breaking new ground but it would be something. 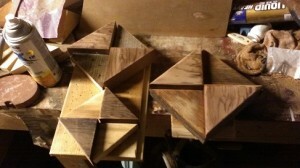 I cut about two dozen or so triangles. some came from barn board, old 2×4 sections, and the support pieces for an ice crushed picnic table. 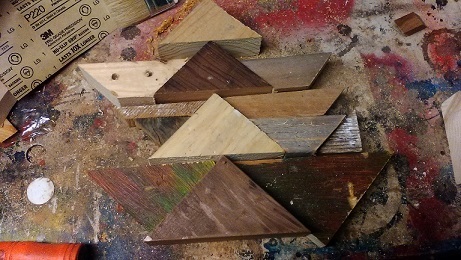 I arranged my motley assortment of triangles into a close approximation of a tree. It was neat but it wasn’t what I wanted. I decided abstract-triangles would be a better way to go. That didn’t work either. Visually it was too harsh and it was too cluttered so you couldn’t get a tactile sense of the topography of the wood or the pattern. Perhaps I was in over my head? I was definitely overthinking things. I picked up a piece of well worn ship lap and started arranging the different sized triangles into diamond/square shapes and then closed the shop for the night and went to bed. It worked. It was simple, but still visually interesting. It also had a lot of elements that could be explored through touch. I made 3 diamonds I mounted two of the shapes on a 8” piece of ship lap and the third on a smaller piece. 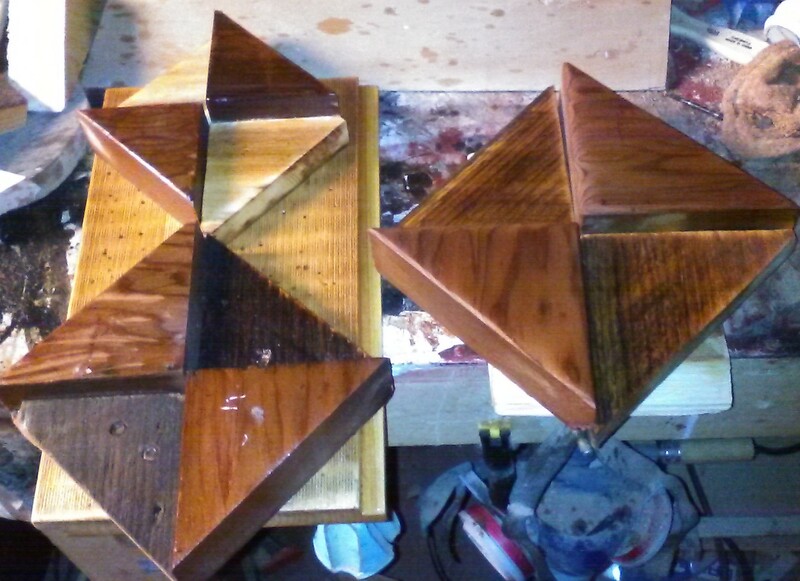 I sanded, filed, sanded, filed, carved, sanded, and oiled everything. I used barn board for the thin pieces of the diamonds, and picnic table pieces for the thicker pieces .I left the tongue and groove edge on the ship-lap, I smoothed out gouges on the picnic table brace, but I did not eliminate them. I wanted to be able to see and feel the history and character of the wood. It was important that whether the piece was explored visually or through touch alone, that it be apparent that it was constructed from recycled and re-purposed materials. I enjoyed the project and I am glad I had the opportunity to think about interacting with and interpreting art through different senses. and I still have a bunch or already cut triangles so I may try this again. This entry was posted in art, old projects, process, repurposeing, scrap wood, wall art, wood working by brighid. Bookmark the permalink.